President of California Senate Calls for Gun Control After 14 Killed in San Bernardino Massacre | Democracy Now! president pro tem of the California Senate. On Wednesday morning, a man and woman armed with assault rifles and semiautomatic handguns opened fire at a social services center in San Bernardino, California, killing 14 people and wounding at least 17. The suspects, identified as married couple Syed Farook and Tashfeen Malik, were later killed by police. The shooting took place about 60 miles east of Los Angeles at the Inland Regional Center, a facility that provides services to people with disabilities. It was the worst mass shooting in the United States since the massacre at Sandy Hook Elementary School in Newtown, Connecticut, nearly three years ago, when a gunman killed 26 people, most of them first graders. Wednesday’s shooting came just five days after a gunman opened fire at a Planned Parenthood clinic in Colorado Springs, Colorado, killing three people and wounding nine. According to a tally maintained by ShootingTracker.com, there have been 355 mass shootings in the United States this year—an average of more than one a day. We speak with California state Senate President Pro Tem Kevin de León, who has been an advocate for stricter gun control. StoryNov 09, 2018After Massacre in California Bar, Will a Democrat-Controlled House Take Action on Gun Control? AMY GOODMAN: This is Democracy Now!, democracynow.org, The War and Peace Report, as we switch gears from the war abroad to the war at home in the United States, to violence, to the latest mass shooting in the United States. 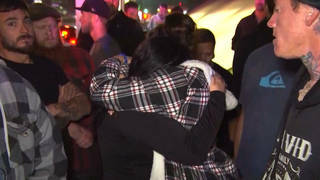 On Wednesday morning, a man and woman armed with assault rifles and semiautomatic handguns opened fire at a social services center in San Bernardino, California, killing 14 people, wounding at least 17. The suspects had been identified by police as a married couple, Syed Farook and his wife Tashfeen Malik. They were later killed by police. The shooting took place about 60 miles east of Los Angeles at the Inland Regional Center, a facility that provides services to people with disabilities. It was the worst mass shooting in the U.S. since the massacre at Sandy Hook Elementary School in Newtown, Connecticut, nearly three years ago, when a gunman killed 26 people, most of them first graders. San Bernardino Police Chief Jarrod Burguan said one of the suspects in Wednesday’s shooting, Syed Farook, was a county health department employee who had attended a department holiday party at the center earlier in the day. The chief said Farook left the party after some kind of dispute, then returned and opened fire. POLICE CHIEF JARROD BURGUAN: Mr. Farook is a county employee. He works with his title as an environmental specialist in the Public Health Department, has been employed there for five years. He was at the party. He did leave the party early, under some circumstances that were described as angry or something of that nature. That is the information that we were following up on when we encountered him back near this residence in Redlands, which led to the pursuit and the officer-involved shooting. And as we’ve now confirmed, he is one of the deceased. AMY GOODMAN: Authorities say the suspects wore masks and body armor, and left behind explosive devices at the scene. They fled in a black SUV, sparking panic in the area for hours. Offices, schools, businesses were closed or locked down as police searched for the shooters. Both suspects were later shot dead by police, who descended on their SUV. Co-workers told the Los Angeles Times Farook appeared to be, quote, “living the American dream.” They said he had recently returned from Saudi Arabia with a new wife he met online. The couple had a six-month-old daughter. FBI Assistant Director David Bowdich said it’s still unclear, still, whether the attack was terrorism. DAVID BOWDICH: I know one of the big questions that will come up repeatedly is: Is this terrorism? And I am still not willing to say that we know that for sure. We are definitely making some movements that it is a possibility. We are making some adjustments to our investigation. It is a possibility. But we don’t know that yet, and we’re not willing to go down that road yet. AMY GOODMAN: The shooting came just five days after a gunman opened fire at a Planned Parenthood clinic in Colorado Springs, killing three people and wounding nine. According to a tally maintained by ShootingTracker.com, there have been 355 mass shootings in the United States this year alone—an average of more than one a day. Wednesday’s massacre was the second mass shooting on that day alone. One person was killed and three wounded earlier in the day in Savannah, Georgia. Responding to the San Bernardino shooting in an interview on CBS News, President Obama repeated his call for gun control. PRESIDENT BARACK OBAMA: The one thing we do know is that we have a pattern now of mass shootings in this country that has no parallel anywhere else in the world. And there are some steps we could take, not to eliminate every one of these mass shootings, but to improve the odds that they don’t happen as frequently. We should come together in a bipartisan basis at every level of government to make these rare as opposed to normal. AMY GOODMAN: Earlier today here in Paris, Democracy Now! caught up with the California state Senate president, Kevin de León, who has been an advocate for stricter gun control. At a café near the Notre-Dame Cathedral, Democracy Now!’s Ariel Boone asked Kevin de León to respond to the mass shooting in San Bernardino. SEN. KEVIN DE LEÓN: First, on behalf of the California state Senate, our deepest condolences and sympathies to the victims of this senseless tragedy, especially to the working-class people of the city of San Bernardino. San Bernardino is about an hour, hour and a half east of Los Angeles, and it’s a working town. It’s a middle-class, working-class, hardscrabble city. Folks get knocked down continuously, but they always get back up, dust themselves off, and work and fight to live for another day. So it’s a city that’s gone through a lot, especially with this latest tragedy. So, our deepest and most heartfelt condolences to the people, and especially to the victims, the family members of this senseless tragedy. ARIEL BOONE: What do you think should happen now? SEN. KEVIN DE LEÓN: Well, I support the president, Barack Obama, with his commonsense proposals to deal with the gun laws—or the lack thereof—especially when it comes to ammunition. The reality as such is that this tragedy that took place yesterday in San Bernardino are coming—are much too common in the United States of America. We have normalized this type of sociopathic behaviors in the United States. And we thought, with the Newtown elementary school tragedy, with the massacre of these young, innocent, beautiful children at Sandy Hook, Connecticut, we thought that that was the final tipping point, that the members of Congress, especially the Republicans, would actually move forward with commonsense gun safety measures to protect community throughout the country. The reality as such is that Republicans and Democrats are victims alike when it comes to these tragedies, and we need to move forward quickly, with a sense of urgency. And that’s why I support our president, Barack Obama, to urge the Congress to stop, you know, sabotaging the president’s efforts to move forward at a national level. I’m the president pro tem of the California state Senate, and the state of California has the most restrictive gun laws in the nation, but nonetheless we have guns that have been exported through the states, like Nevada, Texas, as well as Arizona and other parts of the country. So, California is not an island unto itself, and the reality as such is that we need sensible gun laws, as well as ammunition laws, that is federal in nature, and not just exclusively state. And that’s why I call on the Congress, but specifically the Republicans, both in the Congress as well as the U.S. Senate, to put people, to put communities, to put our children, to put our families above the political rhetoric, above the ideology. ARIEL BOONE: Are you worried that this will fuel fervor against immigrants? So often hate crimes happen after something like this. SEN. KEVIN DE LEÓN: Well, what is tragic is that when we have a massacre of such in San Bernardino, people quickly look for scapegoats. And if your hue—the hue of your skin is different, if your country of origin is different, if you speak a different language, depending on your legal status, obviously, folks are targeted, and xenophobic, racist attacks ensue. That has no place during a tragedy like yesterday’s in San Bernardino. We have to have calmer heads. We need to move forward as a nation, united together. This is a multicultural nation, ethnicities from all over the world. But we need to move forward, first and foremost, with restrictive, commonsense gun laws at the federal level in Washington, D.C. That’s why I underscore and emphasize and highlight, as well as italicize, the time is now. If not now, when? And if not the Congress, then who? The reality is, is that we need to move forward now and not tomorrow. ARIEL BOONE: Where does this resistance to gun control come from? SEN. KEVIN DE LEÓN: Well, I think the most powerful political lobby in Washington, D.C., in the nation’s capital, is the NRA, the National Rifle Association, plus the vendors, the manufacturers, who work very closely with the NRA. The reality is this: The NRA has had a stranglehold on Republicans in the Congress, as well as the U.S. Senate. But the time is now that the members of Congress, specifically that the Republicans, stop praying at the altar of the NRA and start defending our communities throughout the country. Our responsibility as public officials is to do everything within our power to protect our constituencies, to protect our communities, to protect our families, to protect our children. And it’s incumbent on the Republicans to work in a collaborative fashion with the president, our president, Barack Obama, to move forward policies that will protect our communities now and not tomorrow. AMY GOODMAN: California state Senator Kevin de León is president pro tem of the California state Senate, speaking earlier today about Wednesday’s shooting in San Bernardino, California. He’s here in Paris for the U.N. climate summit, talking about divesting from the fossil fuel industry. This is Democracy Now! Back in a minute. AMY GOODMAN: This is Democracy Now!, democracynow.org, The War and Peace Report. I’m Amy Goodman. In San Bernardino, California, two shooters opened fire at a social services center, killing 14 people, wounding at least 17. At a news conference organized by the Council on American-Islamic Relations Wednesday, Hussam Ayloush, the executive director of CAIR-Los Angeles, spoke, condemning the shooting. In an interview on CNN, Ayloush responded to a question about why he was so quick to issue the condemnation. HUSSAM AYLOUSH: Well, because we’re living in a very difficult time. There is a lot of Islamophobia there. There is a lot of anti-Muslim sentiment, fueled by pundits here and there, trying to blame a whole community for the acts of a few. You know, again, we’re just still mourning as a nation after what happened in Colorado Springs by someone who is also responsible for his act—not the Christian community, not the American community. Same thing, we felt there was a need for our fellow Americans to know that all American Muslims share with the rest of the country our sorrow today, our shock and our agony for what happened. It was important for the family. They wanted to make sure that people know how they felt, how devastated they are, and they insisted to being here, although they’re going through their sorrow as we speak now, but they drove all the way to be at the office and speak to fellow Americans and say we are today—we’re all victims today. We stand united in our sorrow, and the only way we can come through this is through our solidarity. AMY GOODMAN: That’s Hussam Ayloush of CAIR-Los Angeles. After Massacre in California Bar, Will a Democrat-Controlled House Take Action on Gun Control?